Mama Moontime Story Mat Workshop! Amber at Mama Moontime has recently started a new session of her Mama Moontime Club, and began with felted Story Playmats. 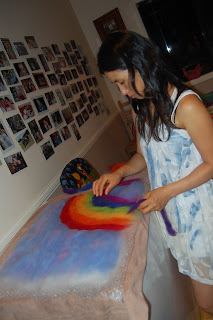 We began this new year of creativity with a workshop on ‘how to make a hand felted storytelling mat’. This is a workshop I often run as a stand-alone. It is a favourite of mothers who see the endless possibilities for imaginative, creative play for their children. I have been asked if I would host one again for women in the local region, and I am more than happy to do this for 4-8 people on Thursday 25th February from 6.30-9.30pm. 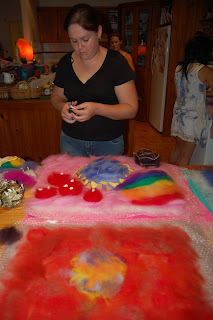 It is open to anyone, from first timers to more seasoned felters. The cost is $40 per person which includes all materials, tuition and supper. Here are some photos from the Mama Moontime Club members making their own story mats. To book in to Amber’s workshop, contact her at her Mama Moontime website. To see another beautiful example of a story mat, visit the Everyday Mum at her blog. She has made her daughter the sweetest fairy garden!